Baked beans are a crowd pleaser. But do they really need to be flavored with soda? Baked beans are a popular side dish at many a cookout. And Dr Pepper is a delicious cola that many people enjoy. But do they really belong together in one dish? One baked bean-maker says absolutely. But the internet isn't so sure. Serious Bean Co is no stranger to packing playful flavors into its baked beans. The bean brand, which debuted at Walmart in April, has Buckin' Buffalo and Cracked Pepper-flavored cans of beans. Now, just in time for the last big barbecue weekend of the summer — Labor Day, of course — cans of a new bean flavor have been popping up on store shelves ... and people aren't quite sure what to make of it. 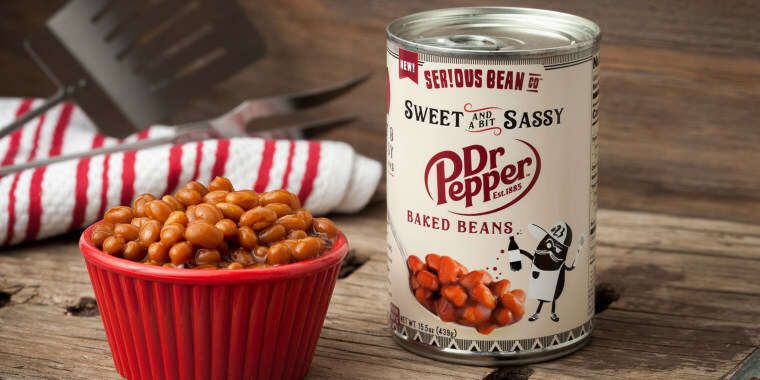 World, meet Sweet and a bit Sassy Dr Pepper-flavored baked beans. And yes, they're really made with the cola. Though the beans first debuted in April alongside Serious Bean Co's other flavors at some stores, more shoppers have noticed them on store shelves throughout the summer. Yet even Dr Pepper fans who worship the mysterious taste created by 23 different ingredients aren't sure if the combo is actually a match made in barbecue heaven. One tweeter said the pairing of flavors is a hard "no." I love Dr Pepper but no , not with baked beans. Yet a more adventurous flavor advocate said adding Dr Pepper to slow-cooker pork shoulder adds a nice complement to barbecue sauce ... so why not add it to beans, too? Dr. Pepper is awesome. Some people pour it over a pork shoulder when slow cooking it in a Crock Pot. It complements bbq sauce so I can absolutely see it being used in a baked beans recipe. Celebrity chef Adam Richman swears by his mom's secret to tenderizing meat, which also utilizes soda. So, marinating a side dish with the same sweet, sparkling beverage may be just the thing our tastebuds need. But even though the bean company calls the beans "sweet and a bit sassy," several instagrammers who tasted the dish said it was neither. One person wrote: "I tried the Dr.Pepper ones and I love Dr.Pepper but omg these two things should NOT go together ugh." Some, however, vouched for the new side with positive comments, with one person noting that the beans were "pretty good." We'll just let Labor Day do its thing and maybe some Dr Pepper Baked Beans will make their way onto our plates.